HS2 is an over-priced, gold-plated project and will fail in many of its objectives, a group of transport experts has warned. The academics support high-speed rail overall, but say HS2 is five times more expensive than its French equivalent. They argue that the benefits of HS2 can be achieved much more cheaply, with lower CO2 emissions, and they want their analysis examined by government. A spokesman for HS2 said options for bringing down costs were being studied. But the academics - including some leading lights in transport - list a series of complaints about the current version of HS2. 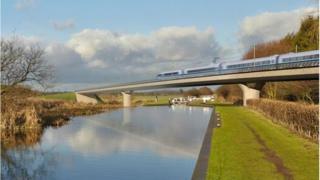 HS2 has been designed to increase capacity and connections, regenerate the North and reduce climate impacts change. Yet the critics say it will only achieve one of these - capacity. Many key rail journeys, they say, would be worse, including to Nottingham, Stockport and Wakefield. The academics are especially baffled by the decision to design HS2 to run ultra-fast at 240mph - that's much faster than the 190mph normal for continental high-speed trains covering much greater distances. One of them, Professor James Croll of UCL, told BBC News: "It is just vanity for the UK to have faster trains than the usual high-speed trains. "The UK is far too small geographically to need an ultra-high speed network - by the time the trains get up to speed it will be almost time to slow them down again. "The decision to design for 240mph has led to a succession of needlessly expensive knock-on effects in construction which will be saddling taxpayers with huge bills for a generation." Professor Tony May from Leeds University told BBC News: "What's needed is an independent, objective assessment of the alternatives. "These would include a less damaging version of HS2, a better-connected new line from London and transport investment in the North rather than to the North. Ben Ruse, lead spokesperson for HS2, told BBC News that HS2 would lure people off cars and onto trains, and so reduce carbon emissions. He said rail speeds were rising throughout Europe - and keeping the speed lower would only cut carbon minimally. He said: "The railway is being designed for the future. It anticipates faster speeds to ensure the railway can take up future technological innovations without having to create further new railways or adaptations to the HS2 route that would cause further impacts. When asked if HS2 accepted that build costs were five times higher than France he replied: "Some costs, such as the acquisition of land and property, are considerably higher in the UK than in Europe - not least because of this country's greater urban density." Jim Steer, founder of the pro high-speed rail group Greengauge, told BBC News there were many differences between the costs of HS2 and rail in France - but that the calculation of a five-fold difference was "not sound". He agreed that ultra-fast running would increase CO2 emissions by about 20% but said it was better than people driving cars. Craig Bennett from Friends of the Earth defended his role. He said there could be a role for HS2 - if it were done properly. But, he said: "We think this HS2 is the wrong project at the wrong time. "We agree that the plan for it to run at very high speed is illogical and will increase carbon emissions. We need a comprehensive national transport strategy to meet low-carbon objectives and we haven't got it."